It often happens that you are browsing the internet and come across some nicely designed websites. Since WordPress powers almost a third of all the websites, there is a good chance that the website is based on WordPress. If that is the case, you can easily find out what theme that website is using. Several online tools allow you to detect the theme for free. Sure, you can find out the theme name by checking out the source code or using the inspect element feature. But these require some technical expertise. On the other hand, WordPress theme detector tools don’t need any special skill. You just provide the website name, and they detect the theme for you, it’s that simple. 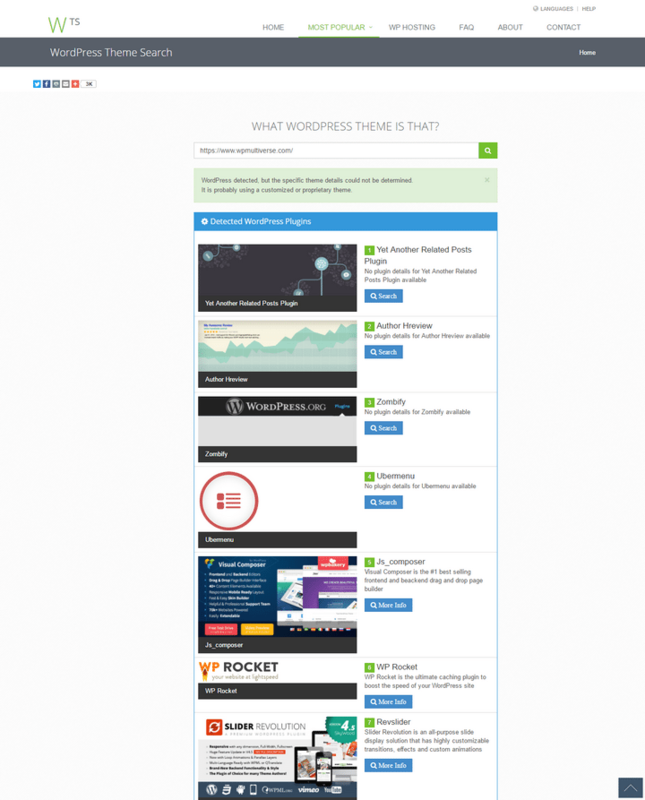 So, without further ado, let’s check out the best tools to detect WordPress themes. 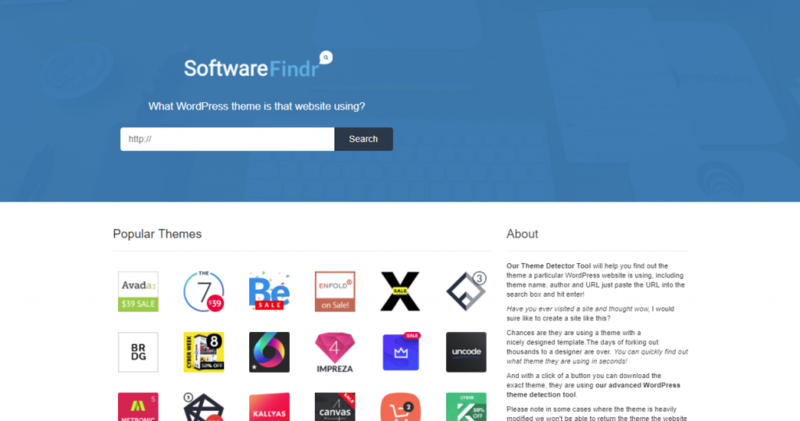 SoftwareFindr also offers a theme detector tool for WordPress sites. The tool will provide the name, description, link, author name and homepage link, theme type, version number, etc. It also shows the current WordPress version of the website. You will also get a real time update of some of the most popular themes sorted by the total number of sales. Below, you will find a list of the plugins used on the website. For each plugin, you will find the name and a link to search for the plugin. 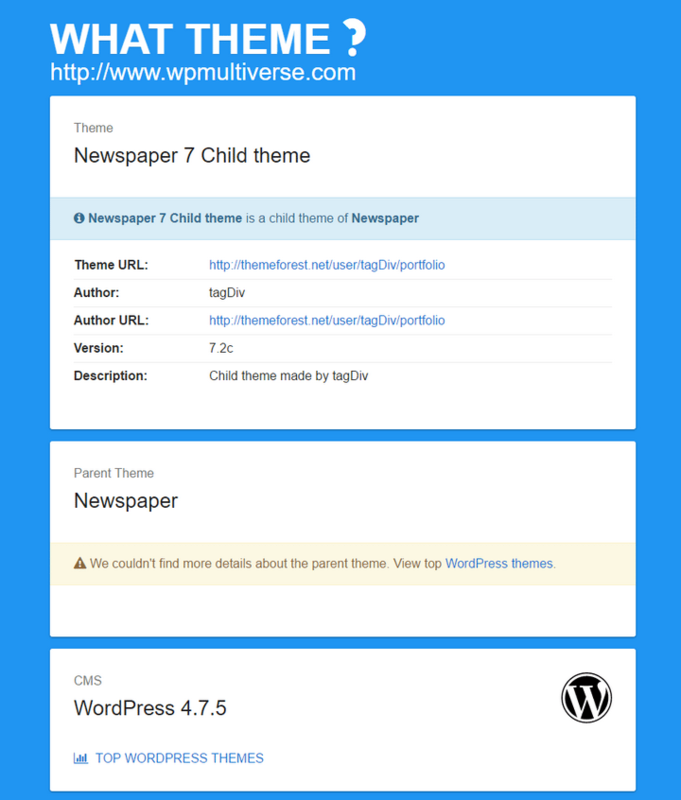 What Theme offers a simple solution to find what theme a WordPress site uses. It is capable of detecting child themes too. Once you submit a website, it takes a few seconds to analyze and provide the result. The tool will show the theme and author name, URL, and the version details of the theme. As an additional bonus, it will also tell what version of WordPress the site is using. 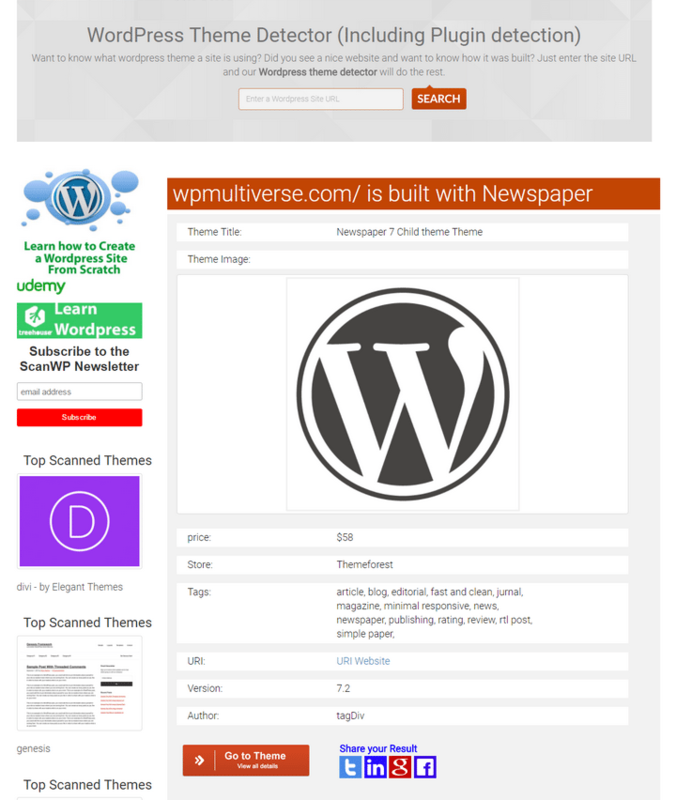 There is a top theme section that shows a list of the ten most popular WordPress themes detected by What Theme. 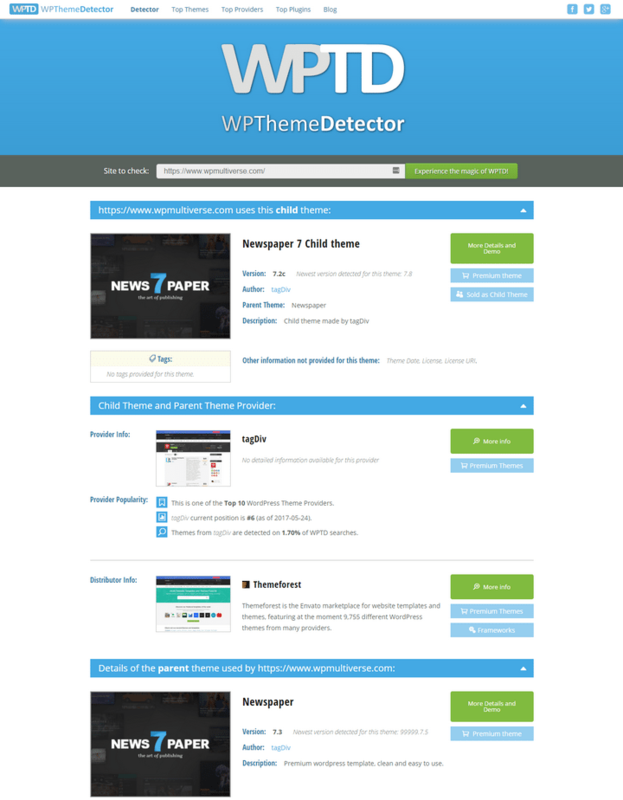 WP Theme Detector is another excellent solution for detecting the theme used on a WordPress site. The tool will detect if the website is using a child theme. It will offer the version number, provider, and distributor information for the theme. The tool also detects the plugins used by the website. For each plugin, it will show the name, plugin type, along with a link to download the plugin. WP Theme Detector keeps a list of the top themes, top plugins, and top providers, which offers some interesting insights about the commonly used themes and plugins. As you can guess from the name, this tool will scan a website and let you know what WordPress theme the site is using. Once the tool detects the theme, it will display the name, link, price, version number, author name, and link, tags, etc. The tool shows a list of the plugins used by the website you just scanned. It will show the plugin name, price, link, etc. for the plugins. The ScanWP tool also shows a list of the top search result competitors for the site you scanned for. There are several Chrome extensions that enable you to find the active theme for WordPress sites. However, most of these extensions don’t work. 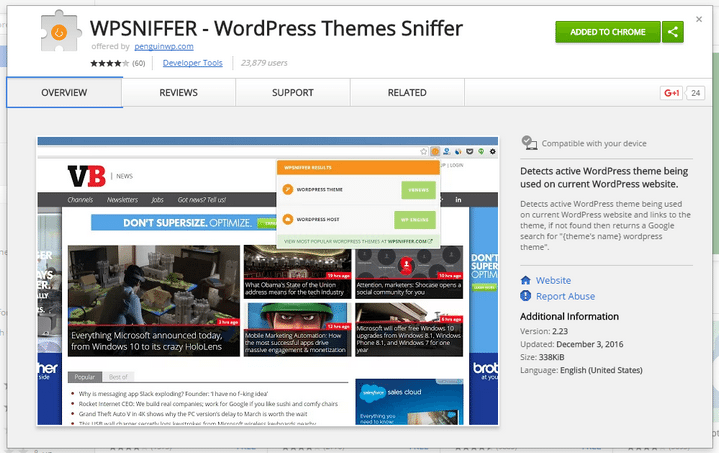 WP Sniffer is a rare extension that can detect most WordPress themes. Since this is an extension, you have to install this on your Chrome browser to detect the theme. Once you install the extension, you will notice a new icon in the extensions section. Visit the site for which you want to detect the theme and click on the WP Sniffer icon. This will show a pop-up with the name and link to the WordPress theme. What WP Theme is That used to be a good tool to detect WordPress themes. But these days, it has become a hit or miss. We tried several websites, and the tool couldn’t find the theme for most sites. Surprisingly, the tool successfully detected the WordPress plugins used by the sites we tested. For each plugin, it will show the name, a short description along with a link to get the plugin. They also offer a handy list of the top 50 WordPress plugins detected by the tool. 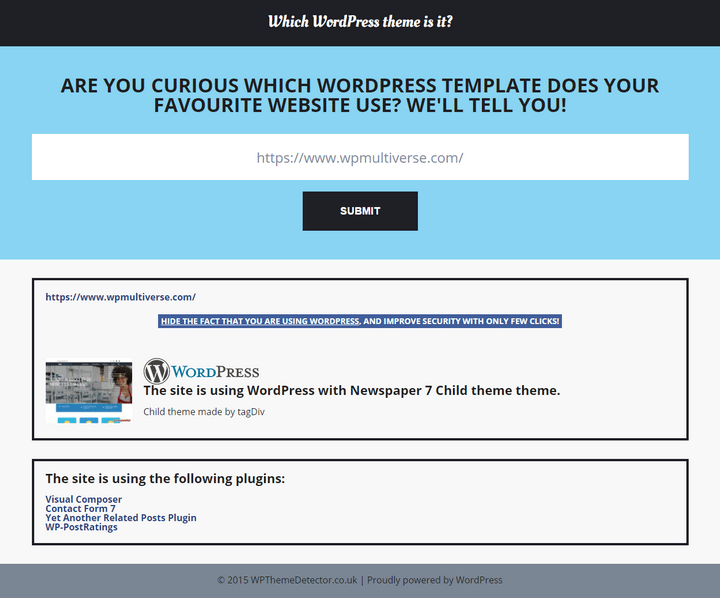 This is another useful tool to help you detect the WordPress theme used by any website. However, unlike the other tools, this one doesn’t show detailed information about the theme. You will only find the theme name and the author name, that’s it. The next section shows a list of the plugins used on the website. You will find the name and link for the plugins. Choosing a great theme is a critical step in creating a beautiful website. Now that you know which are the best tools to detect WordPress themes, you can easily browse your site and find out which themes they are using.